Wednesday July 13th 1881. I got the work done up and went over home early. I had a few words with Bridget about her sister who had been working for Hatt. I think she will get all over it. I worked around the house awhile and sat down to practice. jist about 11 oclock Mother came in and told me to hurry back to town as the water was rising over the causeway. I ran as fast as I could and barely got over without wetting my feet. After supper John got a buggy and took we girls down to see it. 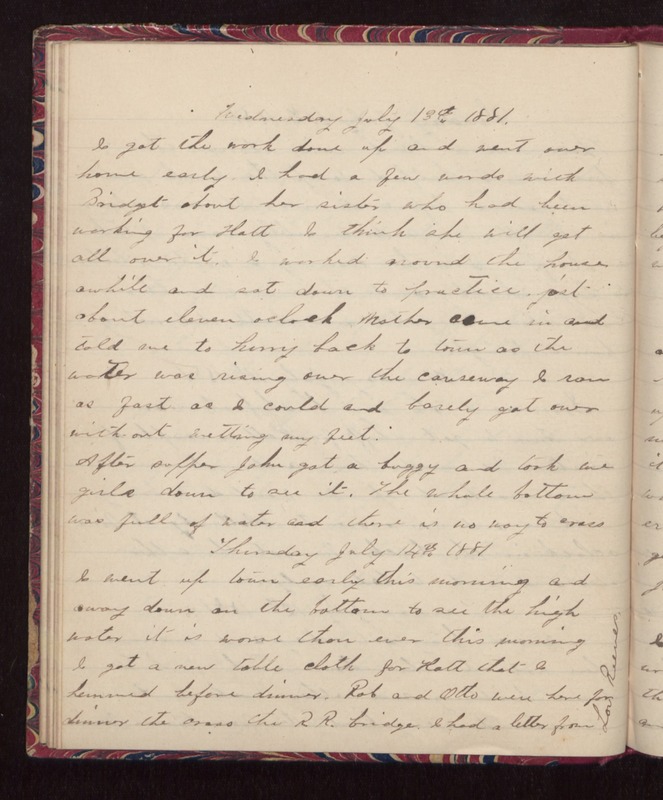 The whole bottom was full of water and there is no way to cross Thursday July 14th 1881 I went up town early this morning and away down on the bottom to see the high water. It is worse then ever this morning. I got a new table cloth for Hatt that I hemmed before dinner. Rob and Otto were here for dinner the cross the R.R. bridge. I had a letter from Lou Reeves.